Produced for Dan and Dave Buck, the English Laundry deck's art was hand-drawn by Christopher Wick, designer of the English Laundry clothing brand. It was printed in limited quantities on Bicycle stock and features silver metallic ink. 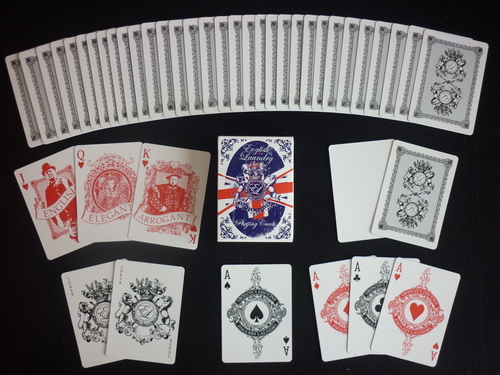 The court cards are the same for each suit, apart from the colour; the King is a hand drawn picture of King Henry the VIII with the word “Arrogant” underneath, the Queen is a hand drawn picture of Queen Elizabeth I (not verified) with the word Elegant underneath, and the Jack is a hand drawn picture of Winston Churchill with the word “English” underneath. Also comes with two custom Jokers, 4 custom Aces, a double backed gaff card and a blank faced gaff card.